In the version 0.974.6 it sometimes happens that the GUI elements are invisible. They are still there, can be operated, but can not be seen. Is that a known issue? One thing I was curious about though graphically was why neutron stars no longer have the dramatic coronae that they used to. Is this an esthetic thing or is it a bug? Old coronae cannot be rendered together with new warp effect. Minor update for fish eye render. Now it's possible to configure it for spherical mirror projection. Not sure if equations I used is correct - I can't test it on real spheical projector myself. Cool! 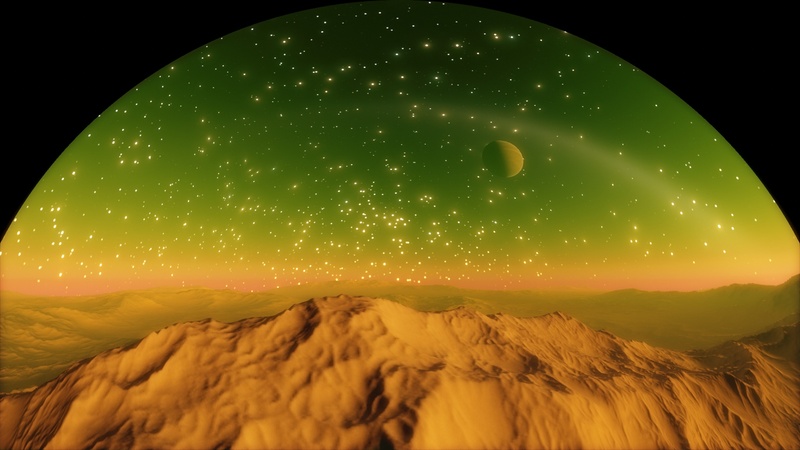 Soon SpaceEngine may be used in planetariums! This is not a patch, but standalone version. It is in a zip archive, so simply extract it somewhere (better not on the disk C:, to avoid permission issues). Thanks a lot SpaceEngineer! Wasn't expecting a pre-release today, thanks again! Awesome! Thank you for this nice surprise, SpaceEngineer. This is a fantastic Valentine's Day gift! Thank you, SpaceEngineer! Now I get to have violet skies in K-class star systems. But I do have a couple questions in regard to atmosphere. 1. Are atmospheric conditions influenced by temperature? 2. Does the sulfuric components of a atmosphere correlate to the level of vulcanism a world has? Using a custom filter for temperature range seems to cause problems. Do you think that in the next version compatibility can be implemented with Windows 10? Great work! I'm loving the new atmosphere sliders! Thanks you very much for the new RC! Quick question, is the elevation map for Pluto available somewhere, or has it yet to be made? Thank you SpaceEngineer! I'm thinking you should add surface composition for procedural planets in the next Release Candidate, 0.9.7.5, or sometime in the future.